This is my first time making kimchi. Actually I wanted to make kimchi for so long. 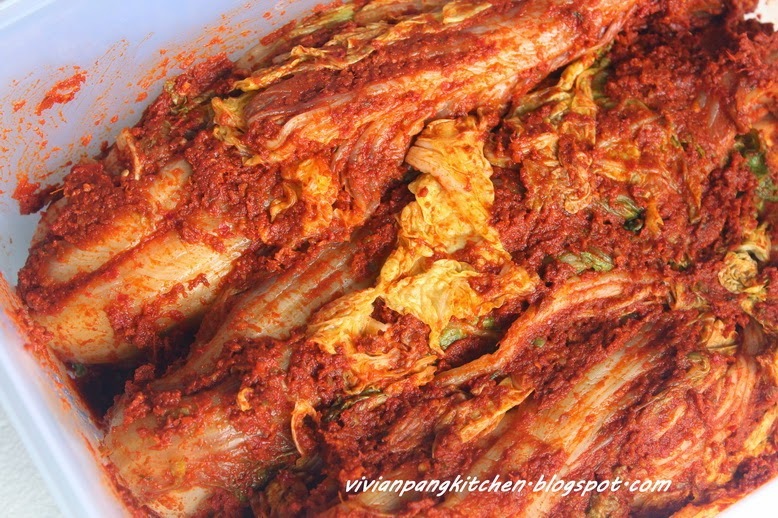 But I have no courage to try until I meet a friend who used to make her own kimchi. Without much hesitating I seek her help. I adapt her recipe with some changes. 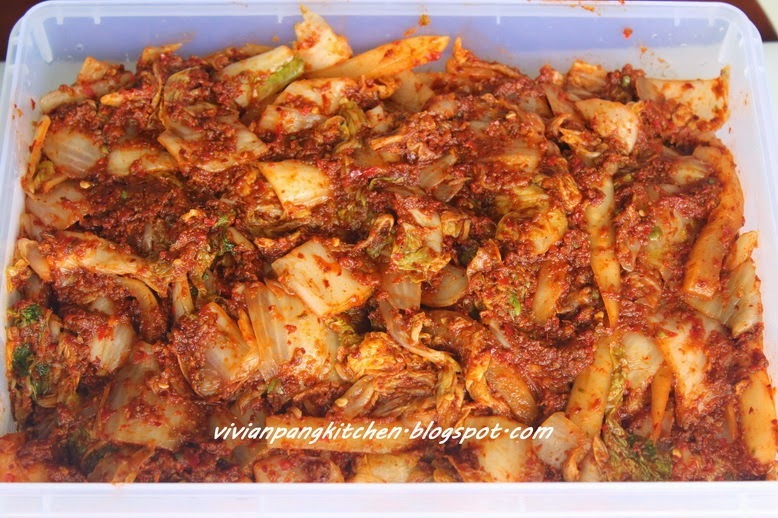 Since I making vegetarian kimchi I omit fish sauce and substitute with vegetable stock. This vegetarian version is using spring onions. For vegetarian consumers who not taking spring onion may omit and increase the amount of ginger. After the cabbage salting process I didn’t rinse with water which some recipe call for. Nevertheless, the saltiness of cabbage is just right. I actually make two batches. For my 1st batch I split each leaves from core and washed. After salting and wilted, I cut into bite size and mix with kimchi paste. In 2nd batch, I cut each cabbage into 4-6(for bigger cabbage) sections with still attached cores. Between these two I prefer the second one, cut into sections. 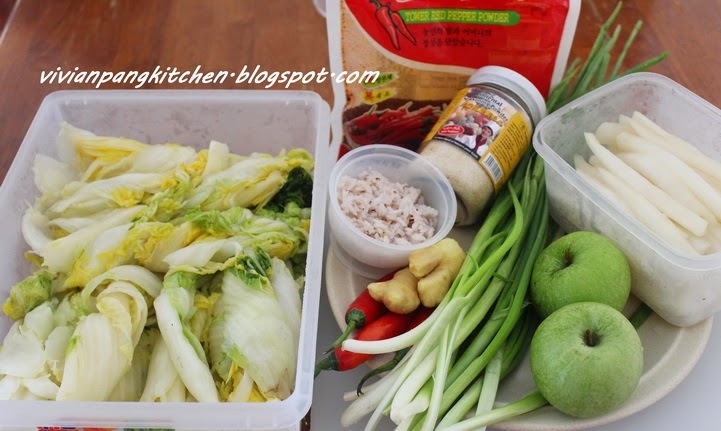 This way the cabbage leaves are easy to wash, salting and kimchi paste spreading. So it is up to you which you prefer. This is 1st batch where salted cabbage is cut into bite size. During the kimchi spreading process I need to spread each leaves! That's why I prefer them in sections. This is the second batch where cabbage is cut into sections. Besides cabbage I used white radish as well. Preparation for radish is easier than cabbage. 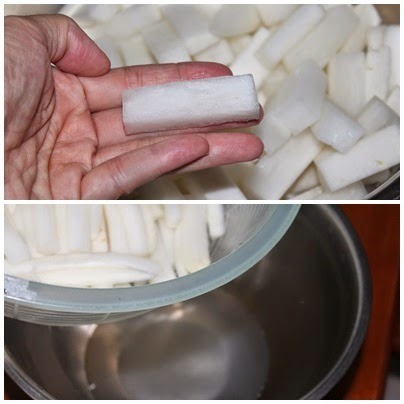 My friend told me it is important to cut radish into thick sticks, about size of finger. After the fermentation process the radish will stay crunch (脆). 1. Trim off cabbage cores if the cores stick out too much. Split a cabbage in half without shredding the densely packed leaves inside. Cut a short slit in the base of the cabbage, enough to get a grip on either half, and then gently pull the halves apart so the cabbage splits open. 3. Soak the cabbage in a large basin of water for about 15 minutes. Wash and rinse well by gently rubbing your fingers between the leaves, especially the core portion. Once clean, put aside and try to get rid excess water. 4. Sprinkle the salt between the leaves by lifting up every leaf and getting salt in there. Use more salt closer to the stems, where the leaves are thicker. Place in colander (I used metal steamer pot together with the base to catch the dripping water). Leave the cabbages rest overnight (about 10 hours). 5. After 10 hours, the cabbage wilt and you may see lots of water gather at the base of pot. Remove excess water in twisting and pressing motion. 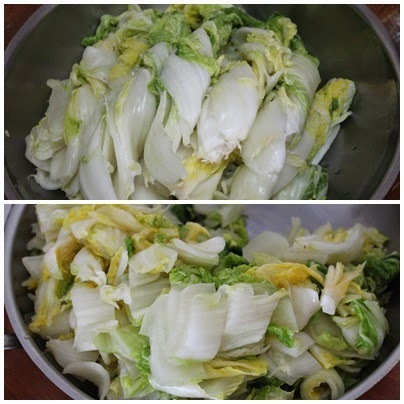 The salted cabbage is ready for kimchi. 1. Put all ingredients (A) into blender, blend till well combine. Add hot pepper flakes and vegetable stock, again blend till well mix. 2. In a wok, add in sesame oil and blended kimchi paste. 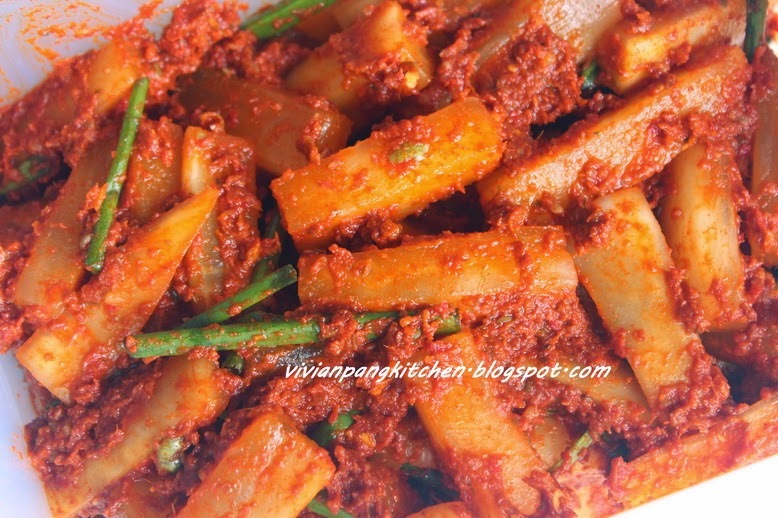 With low heat sauté the kimchi paste till warm enough to touch. Now the paste is ready to be used. 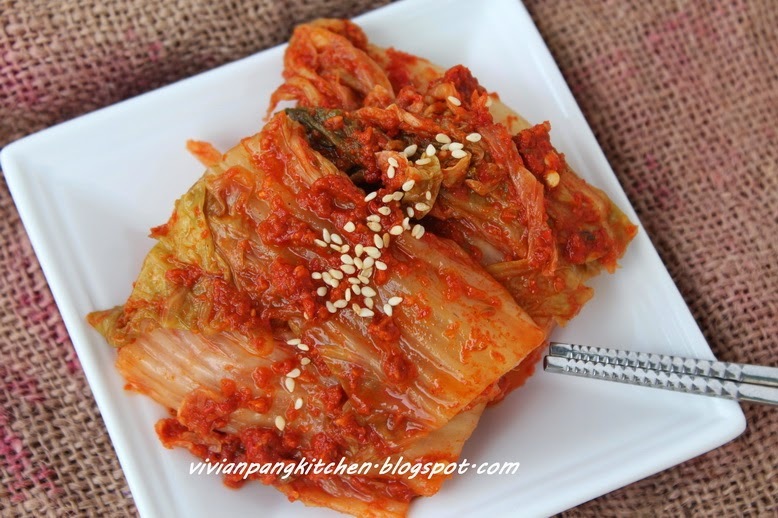 Spread some kimchi paste on each cabbage leaf. After every leaf in a quarter is covered with paste, put into plastic container. Cover and leave at room temperature to ferment. 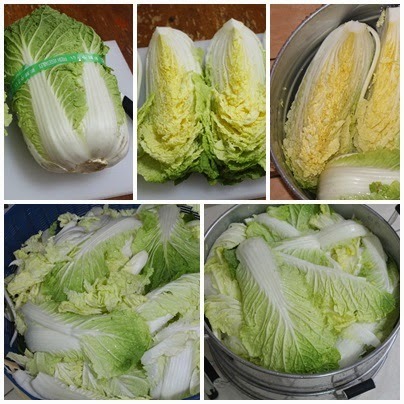 *Kimchi will start fermenting one or two days, depending on the temperature and humidity. The warmer and more humid it is, the faster the fermentation to be. Once it starts to ferment, the kimchi will smell and taste sour. If you pressing the top of the kimchi with spoon, it will release bubbles from beneath. Once you like the sourness level, store in the refrigerator. This will slows down the fermentation process. Use the kimchi anytime as you need. For this coming Sunday, 12 October 2014, Tusita Hermitage (Buddhist Hermitage) is having Kathina ceremony celebration. All sorts of vegetarian food are served. For those who resident in Kuching, do bring your family and friends along to enjoy fresh air and free food at Tusita. I will serve kimchi (泡菜）, remember to drop by my booth and say "Hi"! 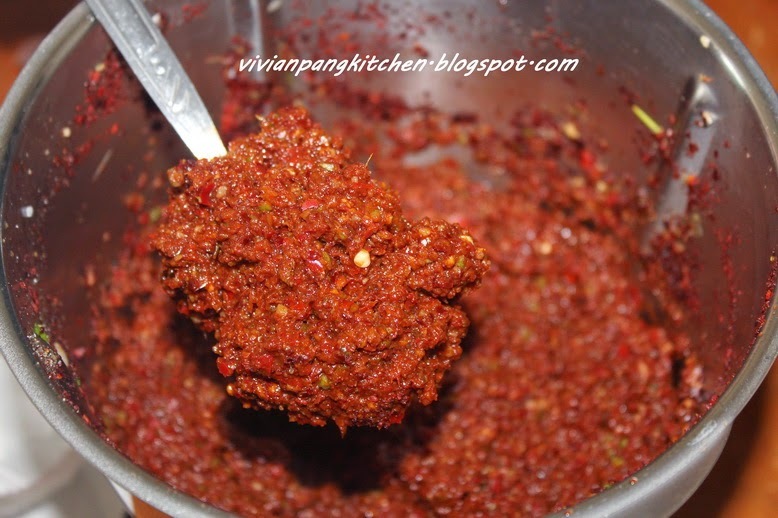 Delicious... May I know where you buy the chili powder in Kuching ? Tks.. Rgs, Susan. I never taste kimchi but i heard it is delicious, i will try it next time i visit korea. Thanks for sharing. This is a big help! 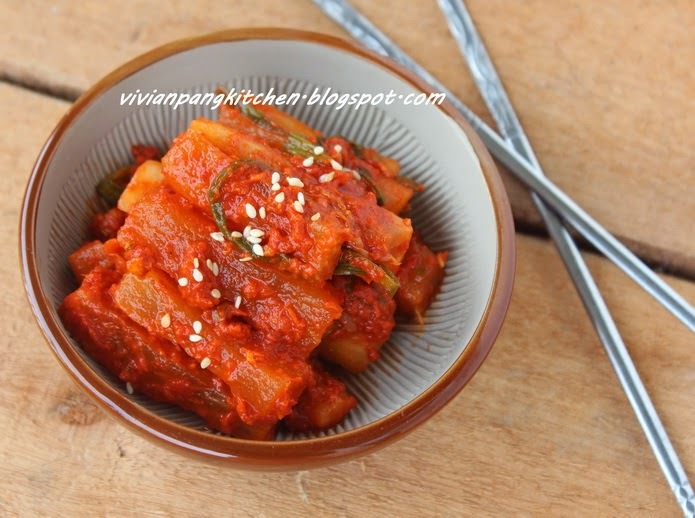 Now I know how to make my own favorite Korean dish, my forever love Kimchi the Korean way! You are amazing,you make your own Kimchi! 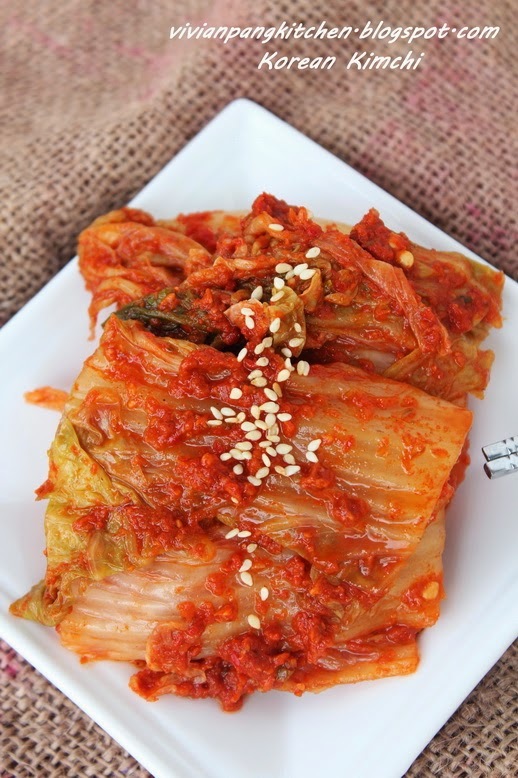 I always want to try what kimchi taste like..
Vegans would surely love this. Kitchen Tips: Use This Special Tool in Cooking!! Vivian....what do you meant with cold rice on the kimchi paste ?